Building owners, property managers and facility operators are looking more and more fo roofing systems that will save them money and more efficiently insulate their properties. One of the best choices for this type of system is metal roofing. Commercial metal roofing has many options for colors, textures, profiles and gauges. To meet these demanding owners and managers, metal roofing is available with shake, slate, tile, shingle and standing seam profiles. To obtain their remarkable ROI, metal roofing’s reflective features will reduce energy costs in the hot summer months. Here at Taurus Elite Commercial Roof Systems, we know your roof is probably the most critical feature of your building. Its your property’s first line of defense against severe weather elements. Commercial metal roofing systems are one of the more longer lasting and durable kinds of roofing. We’ll help you choose the materials and options that work with your company’s choice of style and your available budget. We’ll make sure you understand the replacement process and how it applies to your particular building (or buildings) and how it fits into your building’s profile. When all is said and done, you’ll have a solid custom roofing plan that is truly customized to your particular situation. It Has a Long Life Cycle – They don’t erode, crack or shrink as fast as other roofing material options. Its Durable – High winds and heavy rain will wreak havoc on other roof materials, but metal roofing is designed to withstand it. Even with snow – they are designed to allow snow to slide off, keeping leaks and other problems from popping up due to heavy snow on the roof. Its Energy Efficient – Metal roofing’s energy efficiency is better than other types of roofing options. In studies, it’s been found that metal roofing systems can save a property owner as much as 40% on their energy costs. Eco-Friendly – The materials in a metal roof are usually fully recyclable and don’t have petroleum based materials in them. Easy Maintenance – There is very little maintenance required with metal roofing due to its durability. Design Choices – No matter what type os design or curb appeal you’re looking for, there is a metal roofing option that will work for you. Replacing your old roofing system can be complicated, and we will take no shortcuts to ensure the process moves forward as smoothly as possible and is completed with the highest quality. We’ll take out every facet of your old roof system first, right down to the fasteners and vents. We will replace any fascia boards and sheathing that need it. Only then will we install the new metal roofing system with new drip edge flashing and vents where needed. We will also install new metal in all valley areas of the roof. The metal roofing option you have chosen will then be installed. We take pride in our customer’s satisfaction at Taurus Elite Commercial Roof Systems. 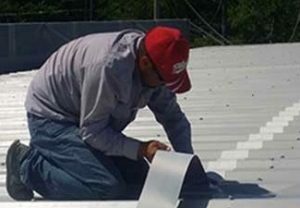 For over two decades we’ve been installing and replacing commercial metal roofing systems. We certify all workers on our crews with OSHA. We can help you in designing and choosing a long-lasting, durable metal roofing system for your commercial building. A lot of metal roofs are replaced prematurely. There is another option available that fits in with idea of updating your metal roof without going through the entire lengthy and expensive process of a complete replacement. Roofing is one of the most costly components of your building, and making it last as long as possible is a must. This is why we offer another solution that will accomplish about the same thing if your building is deemed eligible for it – an innovative roof restoration with a reflective coating system. We take your existing metal roof, fix all issues, replace all fasteners, screws and vents and finish it off by applying a reflective coating over the entire roof, creating a weather-proofed seamless membrane on top. This will make your existing metal roof almost like new. 85% of the sun’s rays are reflected by its surface. Lightweight, reducing stress on your building’s structure. Certified with Energy Star ratings. Future re-coats will expand the lifespan even more. Warranties that can be renewed and extended. Theses solutions will provide long term peace of mind and can even be backed up non-prorated warranties. Taurus Elite Commercial Roof Systems, 512-332-4422, provides commercial roofing services to Austin, Texas and the surrounding area. This includes commercial metal roof repair, commercial metal roof restoration, commercial metal roof replacement and commercial metal roof installation. We have been providing professional commercial roofing services to the area for over 20 years. Give us a call and we’ll sit down and put together a comprehensive plan that fits your building’s unique needs and your particular budget.